Calling all creative thinkers: Invent a distinctive new dip for crisps or veg sticks! We all know dips – salsa, guacamole, sour cream, hummus – they’ve been the staple classics we’ve been eating for years. You can get them in jars from the snack aisle, or fresh in the refrigerated aisle. Sure there have been some changes, perhaps a mild variety here or a new flavour of hummus there, but nothing that has really challenged the status quo. Until now. 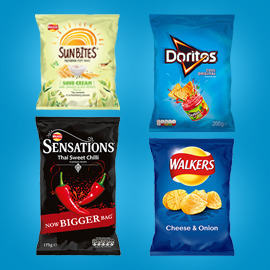 The producers of famous crisps Doritos, Sensations, Walkers and Sunbites need your help to surprise and delight shoppers with original ideas for new dipping products for crisps, nachos and veg sticks. Can you crack it? Create an original and delicious Doritos, Sensations, Walkers or Sunbites dipping product for people to eat with crisps, nachos or veg sticks. Format: 1 page on a white background, including 1 lead visual (and supporting visuals if necessary) and under 150 words of text. Send us your entries before July 22, 2015 23:59 UTC! Good luck!